How much does it cost to recover a pool table? Pricing varies on a number of factors for recovering pool tables. Size of table, type of table, type of cloth, etc. All of these factors can vary greatly and need to be discussed before any pricing is finalized. Foundational costs can be found on our Services Page. However, we recommend a conversation with one of our table specialist to help you determine the best solution for your particular needs and budget. How long does it take to recover a pool table. Installation times can vary depending on a number of factors. When you setup your appointment with our team, they should be able to give you some timeframes for the work to be completed. On average, installation times range from 2-5 hours. We can't speak for our competitors knowledge, workmanship or pricing. However, we can speak for ours. 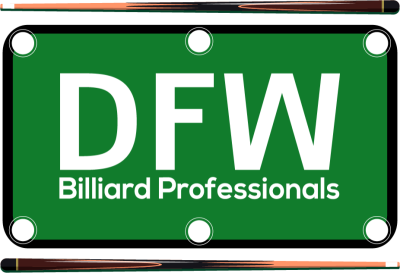 Our team has a broad and deep level of experience in the billiards world. We have owned and managed large pool rooms, performed cue and table work, and been an enthusiast of the sport for over 15 years. We pride ourselves on quality of work, open communication and an overall professional experience. Just give us a call and we are confident you will know immediately if we are the right company for you. We are looking to buy a table, should we buy new or used? This is such a great question, however, the answer really depends on your preference. It is much like buying a house or car. Some people simply like the idea of having something brand new with no history or potential risk of something being wrong and not seen. While others are willing to take a little risk to save some money and get a great deal. The final factor is quality and cost preferences. If a buyer isn't interested in longevity and high quality of play, then they can find a fairly inexpensive new table for as little as $500. However, these tables do not have slate foundations, are not made of solid wood frames and will tear up quickly compared to a quality table that does have slate and solid wood framing. Furthermore, these tables will not play near as well as a quality pool table that retails for several thousand dollars. For the most part, we would recommend someone buy used. There are several reasons for this. First off is that pool tables depreciate really fast and they are not the easiest to sell. Many people who buy tables and then need to sell them due to moving, downsizing, or other reasons find that the market is flooded with pool tables for sell, and they can't get anywhere near their initial investment back out of the table regardless of our expensive it was initially. This is what makes buying a used table the best option, in our opinion. Furthermore, should you find yourself needing to sell your table, you will not have to take the depreciation hit and can probably get most, if not all, of your money back out of your table. The key to buying used though, is knowing what to look for and knowing how much to pay. This takes experience and knowledge about pool tables. This is an area that we have helped many customers with for a small commission fee, and the follow on work of moving and repairing any needs the table has. We help identify the need and preference the customer has, establish a budget and then we go to work seeking a seller that meets the needs of our client. In most cases, our clients spend $1,500 - $2,000 in total and end up with a completely moved, setup and recondition table that would have cost them $4,000 - $6,000 otherwise. If you are interested in such a service, just give us a call and let us know. With a used table you can usually get a table for as little as 10% of it's retail cost. Furthermore, since the table has to be moved and re-setup, you can combine that expense with getting any updates to the table made (cushions, felt, etc.). After everything is said and done, you could have an incredible table for half of what retail would have cost. What goes into moving a pool table? Moving a pool table is not small matter. Unlike other furniture pieces, pool tables are made to be assembled and left alone. Should you need to move a table, the worst thing you can do is simply get a bunch of guys, flip it up on it's side, and haul it out the door. Doing so will most likely damage the table and possibly even cause injury to someone. Few pool tables can be moved without taking them completely apart and moving them piece by piece. This is why you will find table moving services by professionals such as us, costing hundreds of dollars. Special tools and expertise is necessary to breakdown, transport and properly reassemble a table. Remember, even if you buy a table used, account for the cost of having a professional move and set the table back up. By doing so, you will ensure protection of your investment and the best playing environment possible.